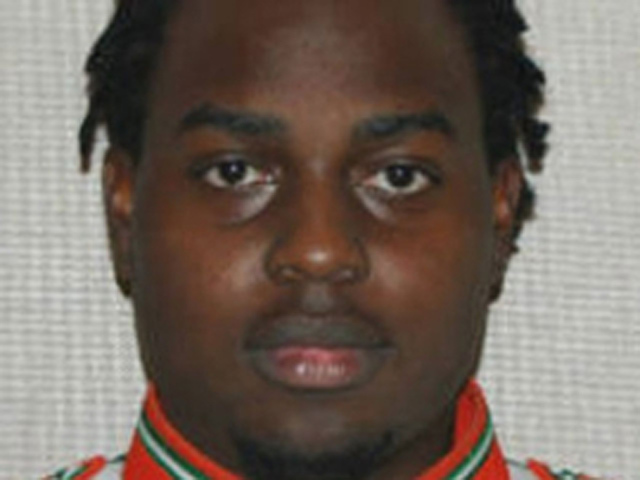 ORLANDO, Fla. - A Florida A&M University drum major was severely beaten in a hazing incident last month and died within an hour, the state medical examiner said Friday in declaring it a homicide. Robert Champion, 26, had bruises to his chest, arms, shoulder and back and internal bleeding that caused him to go into shock, which killed him, the office said. Champion's Nov. 19 death and the severe beating of another band member during a hazing ritual three weeks earlier have brought new scrutiny to a culture of hazing within the Tallahassee school's famed Marching 100. State and local authorities are investigating Champion's death. Any death involving hazing is a third-degree felony in Florida, but so far no charges have been filed. Three male band members were arrested in a separate probe into the recent beating of a female member whose thigh bone was broken. Witnesses told 911 that Champion was vomiting before he was found unresponsive aboard a band bus outside an Orlando hotel after the school's football team lost to rival Bethune-Cookman. The report by Dr. Sara Irrgang described Champion as "previously healthy" showing "no evidence of natural disease" except for a slightly enlarged heart. Immediately after the hazing, Champion complained of thirst and fatigue, then loss of vision and signs of shock, the report said. The toxicology report was negative for drugs and alcohol and there was no injury to the internal organs. Champion's father, Robert Champion Sr., said he knew his son had been hazed. "We just need to figure out what we need to do now to get the hazing under control," Champion told The Associated Press from his home in suburban Atlanta. The family's attorney, Christopher Chestnut, said the autopsy confirmed the family's worst fears: "Justice needs to be swift and immediate." "We're not calling for dismantling of the band," he said. "There needs to be high-level scrutiny. The students are adults, but they're young adults." Champion's name was repeatedly invoked during FAMU's winter graduation ceremony Friday by Narayan Prasad, a faculty and board member. He called on graduates to be "Champion Rattlers" and to help ensure that hazing never happens again. Larry Robinson, assistant secretary of commerce in the Obama administration, acknowledged Champion in his commencement speech. He said there were "dark clouds in our midst" but he predicted the university would overcome the scrutiny and survive. "The world is watching. Let them see, let them hear the real FAMU. Let them know we have been here 124 years and we plan to be here another and yet another." News of the autopsy came soon after Gov. Rick Scott met privately with FAMU President James Ammons to discuss whether he should step down. Ammons was reprimanded by the school's Board of Trustees, but the governor says he thinks Ammons should be suspended until multiple investigations are complete. FAMU's president does not report directly to the governor. But the governor is responsible for selecting some of those who serve on the FAMU board of trustees. The governor also appoints most of the people who sit on the board of governors that oversees the State University System. A couple hundred FAMU students protested late Thursday night outside the Governor's Mansion to show their support for Ammons. Scott eventually came outside and talked to them, but he did not back off seeking a suspension. Ammons said he and the governor had a "great discussion" and he was considering the request. "We all have the best interests of Florida A&M University at heart, we are going to do what's best for university," Ammons said. A new wrinkle comes from the Southern Association of Colleges and Schools Commission on Colleges, which has warned that Scott's push to suspend Ammons could affect the school's accreditation because of "undue influence" on the board from outside. "This information is extremely upsetting for all of us, even though it confirmed what we suspected," the joint statement said. "We again convey our deepest condolences to the Champion family. We will continue to cooperate with all agencies looking into the matter and are committed to creating a safe environment for the entire FAMU community and ensuring that this never happens again at FAMU." Separately, a group of black Tallahassee ministers formed a task force charged with battling hazing at all historically black colleges and universities. Student leaders at FAMU have launched an initiative to encourage every student on campus to sign an anti-hazing agreement; clubs and organizations that don't sign risk being sanctioned by student government. Hazing cases in marching bands have cropped up over the years, particularly at historically black colleges, where a spot in the marching band is coveted and the bands are revered almost as much as the sports teams. In 2008, two first-year French horn players in Southern University's marching band had to be hospitalized after a beating. A year later, 20 members of Jackson State University's band were suspended after being accused of hazing. In 2001, FAMU band member Marcus Parker suffered kidney damage because of a beating with a paddle. Three years earlier, Ivery Luckey, a clarinet player from Ocala, Fla., said he was paddled around 300 times, sending him to the hospital and leaving him physically and emotionally scarred.